Doug Graham, vice president of missile systems and advanced programs for Lockheed Martin, a major defense contractor, told reporters in a briefing that missiles pose "an accelerating threat, both in numbers and complexity." "We’re also seeing advanced threats … hypersonic, maneuvering threats, that are being characterized as directly challenging the capabilities" of the current U.S. ballistic missile defense system, Graham said in a teleconference from Huntsville, Ala. Growing missile threats are driving the need for a greater quantity of missile defense arrays, as well as more capable systems equipped with better sensors, increased ability to detect decoy warheads, and ultimately the ability to target missiles shortly after launch when they are more vulnerable to attack–so-called "boost phase" intercept systems. China and Russia are both developing hypersonic missiles that travel at speeds up to 7,500 miles per hour along the edge of space and have the ability to maneuver, complicating the task of intercepting them. The Pentagon is also working on hypersonic missiles, but is investing far less than either China or Russia. Russia conducted a flight test of its experimental Yu-71 hypersonic glider in April that was launched atop an SS-19 intercontinental ballistic missile. 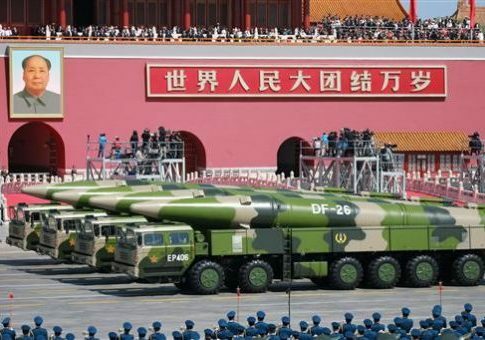 That test was followed three days later by China’s seventh flight test of what is called the DF-ZF hypersonic glider on a missile that flew from central China to the western part of the country. The missiles travel at speeds of between Mach 5 and Mach 10, or between 3,800 miles per hour and 7,672 miles per hour. One system being looked at by the Pentagon’s Missile Defense Agency to counter maneuvering high-speed missiles is an enhanced version of Lockheed’s THAAD, called THAAD-ER. The current THAAD-ER system uses a two-stage interceptor with higher velocity that would be capable of catching up to and destroying hypersonic missiles. Laser weapons also are being considered for use against hypersonic missiles. Lockheed is working on lasers that can hit hypersonic missiles shortly after launch and before they reach ultra-high speeds, Graham said. "We’re seeing significant interest [in THAAD-ER] from users in PACOM and other places," he said, noting that Congress also is prodding the Pentagon to develop missile defenses against advanced threats. "THAAD-ER is certainly one candidate and one of the more near-term options that the U.S. government has [in order] to begin addressing some of the advanced threats that are emerging," Graham said. The current defense authorization bill contains a provision that would require the Missile Defense Agency to set up a specific program for developing weapons to defeat hypersonic missiles. The advanced missile threat is also driving demand in the Pentagon for laser guns, and Lockheed is working to develop a high powered laser deployed on a high-altitude, long-endurance drone aircraft. The laser would target missiles in the boost phase–shortly after launch. "If you can do that, you can kill them long before they can do things during their trajectories to evade defenses," Graham said. Using lasers against high-speed missiles poses challenging technical problems, he added. However, Lockheed’s missile defense specialists believe the most effective solution to killing missiles in the boost phase is by using high-energy lasers. Contracts for work on anti-missile lasers are expected to be announced by the Missile Defense Agency in coming months. An earlier Pentagon program to build an airborne anti-missile laser inside a Boeing 747 jet was canceled several years ago. Lockheed is currently conducting research into weaponizing fiber lasers–lasers that fire beams of light using an optical fiber treated with rare-earth elements. Graham said the advanced missile threats pose "very complex and challenging" problems for missile defenses, and the Pentagon is pursuing a variety of ways to counter them. A Missile Defense Agency spokesman had no immediate comment on efforts to counter hypersonic missiles. Graham said the high-speed missiles typically operate in the zone covered by THAAD anti-missile interceptors–between the upper atmosphere and near-earth space. For lasers, development could take five to 10 years before a laser weapon capable of hitting missiles in the boost phase is ready. "High energy lasers are the fastest, most agile intercept capability that we have," he said. In February, Vice Adm. James Syring, the Missile Defense Agency director, said THAAD-ER development was not being sped up, but is being continued. If the advanced THAAD system is approved it would be a 10-year development program, he said. Syring said the agency is systematically looking at how to counter hypersonic threats. "And I throw THAAD-ER into that mix, or any other capability that we’re looking out against the hypersonic glide vehicle threat that we see materializing in the future, and I’m comfortable that we’ve got the key decision points laid out over the next several years on laser capability, and I’ll just leave it at that, interceptor upgrade capability, and more sensor capability as well," the three-star admiral said. Lockheed is involved in building the ship-based Aegis anti-missile systems that are being adapted to ground-based interceptors in Europe. The company is also working on redesigning a multiple kill vehicle for the ground-based missile defenses currently deployed for use against long-range missiles from North Korea, which in recent months has conducted nine missile tests. The current THAAD system is slated for deployment in South Korea, despite objections from China that the missile defense system could be used to counter China’s ballistic missiles. Lockheed also is building enhanced Patriot PAC-3 missile defenses and a 5-pound, mini-hit-to-kill interceptor for use against artillery, rockets, and mortars. This entry was posted in National Security and tagged China, Lockheed Martin, Military, Missile Defense, North Korea, Pentagon, Russia. Bookmark the permalink.